Hooray! Today we get to finish up the Think Pink Blanket (Lapghan? Whatever!). I'm going to tell you how I did the final border on mine, but like everything else about this blanket, it's merely a suggestion. Please feel free to do whatever your heart desires!! 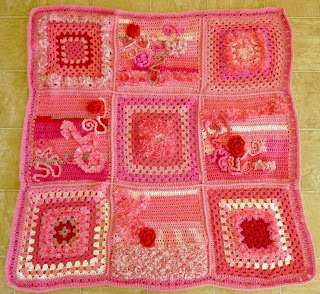 Because I edged each square before I single crocheted the blanket together, I didn't feel like I needed an additional row of our 'tie-it-all-together' pink. I wanted to reinterpret the 3 dc motif of the granny squares in the border, to make the overall look of the blanket cohesive (pretentious much?! LOL!!! I swear, I just thought it would look cool, and make the blanket look like it was planned instead of -as we know- all a whim.). I repeated the pattern so that there were thirty-four 3 dc sections along each side. When I got to the corner, I ended with the 3 dc, but I chained 2 in the corner, skipped 1 stitch, and then began the next side. I slip stitched the round together when I got all the way around and back to the first stitch. The final row is very easy. 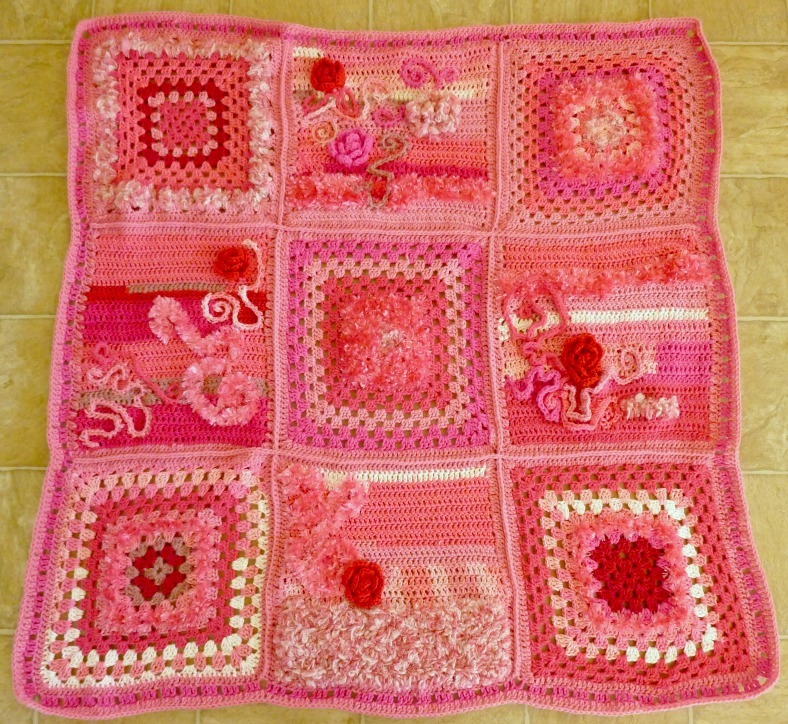 Attach your 'tie-it-all-together' pink yarn, and dc in each stitch (and ch space) along each side. I put 5 dc in each corner chain space, and sl stitched the last stitch to the first stitch when I got all the way around. 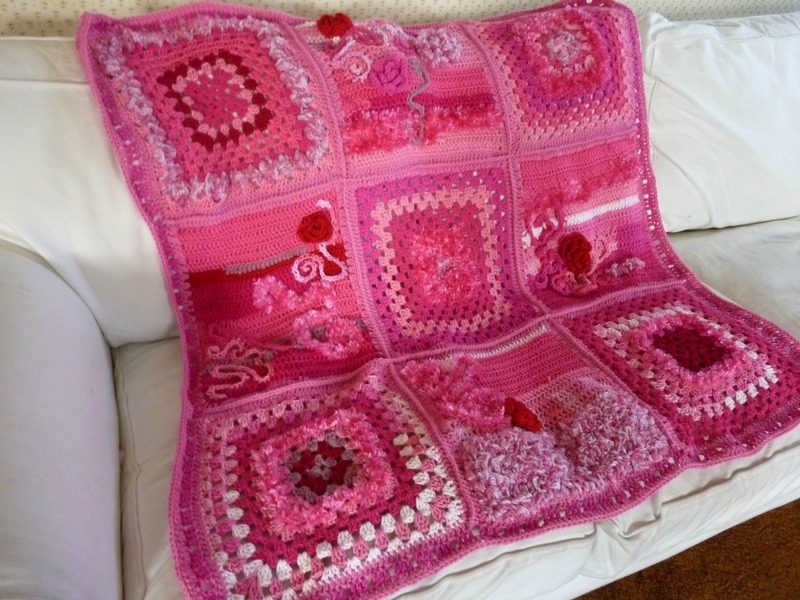 Speaking of breast cancer, if you enjoyed this tutorial (and make a blanket based on it) would you consider making a donation to your favorite cancer-research-supporting foundation? My grandma and I would really appreciate it! Also, if you haven't already, why not hit the 'LIKE' button for Facebook on the side over there. or sign up for Crochet Dynamite posts to be delivered straight to your email? Become a Dynamo today! It will make us BOTH happy! Yeah, that's the kitchen floor. The housekeepers had come, so I knew it was clean! LOL!!! You can also pray over the finished blanket with a group of believers and then it will be a prayer blanket for someone who went through, or who is going through cancer. God is able, I will pair my faith with your's and together we can be strong. I am willing to always lend my prayers to anyone, and pray daily for all who are suffering, know someone cares and you are never alone. Thanks Jaime, for being so inspiring, it makes me cry because you're so beautiful. Piper! What an amazing idea! You are so sweet. I love, love, love that about you! Thank you for being my friend! Thank you for being my friend too Jaime! You have the best dynamos over here you know. Every time I read the comments, I'm touched by the thought that goes behind them and I love that it is not all just, "Hi. Great post." I totally agree with Eliz - the yellow behind the pink is fabulous! And Piper's idea is awesome. I think people coming together no matter their faith in order to help fellow human beings says so much more about them than the title of their religious beliefs or non-beliefs. And now I forgot what I was going to say in the first place - oh wait - no I didn't - it was that I love the border you did. By skipping the stitch every fourth time on the first round, it makes it look like the next round is floating! I have a wedding ring afghan I make (not my own design) that has a border that works similarly and I love that. It's so different and adds a special touch. Okay, I'll stop blabbing now before I wear out the internet. Thanks Teeni! I completely agree! I don't know how I got so lucky to find such an amazing group of friends online, but I feel blessed every day that I get to hang out with all of you!! I tell everyone I know that the Dynamos are the coolest people I know. I agree with you too, I feel like love transcends beliefs and religious affiliations. I have consciously made an effort to be non-political and non-religious on this site, but it's so that everyone who stops by will feel loved, appreciated and respected. It almost doesn't matter what I believe, you know? And I was thrilled with how the border came out! I'm so glad that you like it too! You've made me curious about the wedding ring afghan now. I'm thinking you're going to have to post pictures somewhere... LOL!! Agreed! Being non-political and non-religious makes everyone feel welcome! There are enough other areas people can go if they want to argue that stuff. LOL. Oh, I do actually have a photo of the afghan in my non-amigurumi album on my MCL facebook page! I think you'd like the afghan. It's lovely. I wish I remembered who to credit. It was from an old magazine I no longer have because I wore it out. But I was smart enough to scan the chart before I lost the magazine to pieces. I think it was a Crochet World or something. Maybe someday it will turn up. But I've made it often and it has the same type of floating border - different design and stitches but you will see what I mean. I absolutely love this idea - my neighbor, who is also one of my best friend's, has been suffering from Lupus for several years. I'm already starting to look for purple yarns to make one of these for her to give as a gift in June during Lupus Awareness Month! Hi Jamie! Aww, I love the idea of a purple Lupis Awareness blanket! Purple is also the 'color' of Lymphoma Awareness, so I'm thinking I might need a purple one too! Great idea! My Aunt is 101 y.o. , her favorite color is Pink. Time to shop for pink yarn...can't wait to start. Thank you for sharing a beautiful idea!